September 2005 update: I have now added rolling resistance data obtained in summer temperatures (see page 1 for an explanation). The right-side-up triangle is my trike version 3 with two results of .008. The spread doesn’t show temperature effects. The upside-down triangle represents two Trice (ICE) trikes. Both coastdowns gave the same result of .01. The trikes had a combination of Schwalbe Marathon Slicks and 1.35” Primo Comets. One trike had two Slicks and one Comet, the other had two Comets and one Slick. These trikes were slower on side-by-side coastdowns against my trike. The vertical diamond is one of the Trice (ICE) trikes but with 1.5” Comets on all three wheels. The result is .008. Note the improvement with these fat tires. The narrower Comets are known to have a higher Crr than the fat ones, and the Slicks definitely have higher Crrs. The right-facing triangle without the inside dot is my trike, version 4 with a value of .009. This reading could be on the high side because I did not make a Crr-vs-tie rod adjustment to determine the lowest Crr. The toe-in was set with a mechanical measurement. The right-facing triangle with the dot inside is version 5 of my trike with a value of .008. So far this .008 number is the lowest I have seen on several coastdown tests on trikes. I have not done a Crr-vs-tie rod adjustment as yet to check for the lowest Crr. 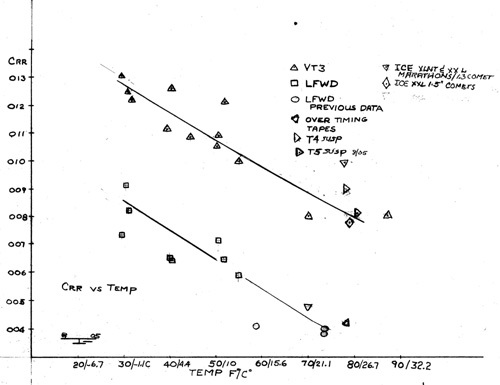 Although there is a spread on this recent data, it still shows the Crr vs temperature effect. I’m concerned as to why the trike Crrs are almost twice that of a bike. I believe my data was obtained carefully, but in case there is something off in what I am doing, I would like to see on-road verification data taken by other trike users. My test course road surface is relatively smooth macadam blacktop.